They've been using Happy Mood Score to get feedback from their employees and improve their engagement using peer-to-peer rewards. Zeo has also integrated the HMS metrics and peer-to-peer rewards tool into their own company mobile application using the API. Present your company to our readers. 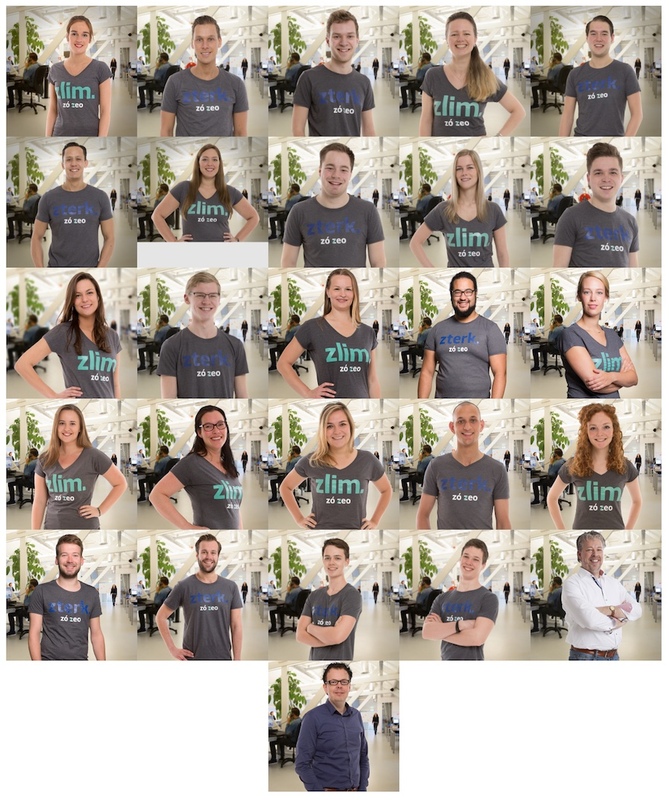 What you do and How many people work at Zeo? Zeo is a full service online marketing firm. Our slogan is “We get energy from winning” and that is something we want to let everybody know. When you have a good collaboration between the client and Zeo, the sky is the limit. We work with 35 happy persons on online marketing and development. For online marketing we work on all online channels, like AdWords, Facebook, LinkedIn etc. For development we mostly work with WordPress and Magento. Zeo has a competitive mindset and giving High 5’s to each other connects perfectly to this. You’ve been using Happy Mood Score for a while. What is your experience so far using it. What do you like the most? It’s true that we’ve been using Happy Mood Score for a while now throughout the whole company. 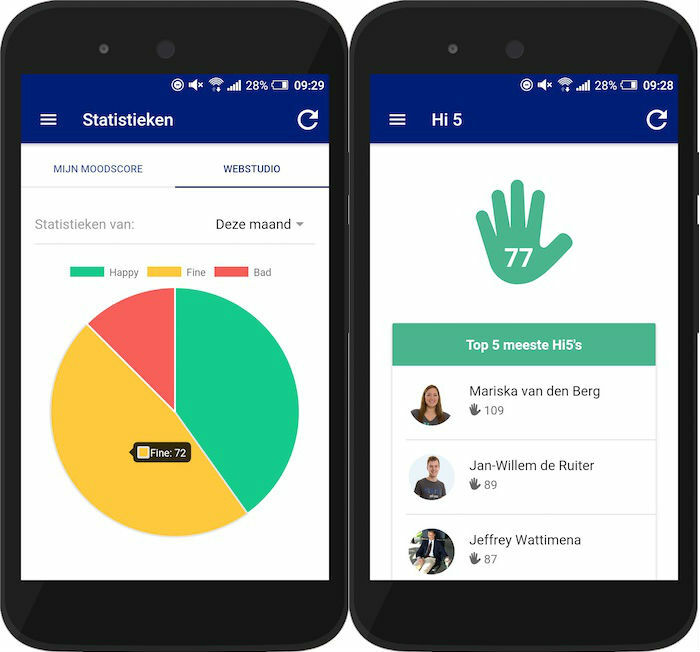 One of the major features for us is the High 5 system. Zeo has a competitive mindset and giving High 5’s to each other connects perfectly to this. We also make a lot of use of the metrics which are measured by the “How was your day?” mail. This gives the management good insight in the overall satisfaction of the employees and helps them to improve the quality of our working environment. We are not only colleagues but we also do a lot of extra things outside work, like sporting, drinking and having a lot of fun. You are a company that really cares about their people. How do you keep people engaged and motivated. Any activities you do as a company? Happy Mood Score is one of many tools we use to see how the people at Zeo are feeling. We are not only colleagues but we also do a lot of extra things outside work, like sporting, drinking and having a lot of fun. People at Zeo get the room to think with the company, everybody has priorities every quarter. You guys have developed your own mobile app. Tell us more about this app what it does, what goals you want to achieve with it, how is Happy Mood Score integrated in it. There was a demand within our company for a mobile application where it would be easy to contact coworkers. Because of our active use of Happy Mood Score, a nice to have feature was an integration to easily send each other High 5’s and view the HMS metrics. At the time of developing the mobile application there was no public API available, so I contacted Happy Mood Score and within a few days they released the V1 version of the API. In this first version of de API it was possible to send High5’s. After integrating this feature within the Zeo application we received a lot of positive feedback. Not much later the API was extended and we could implement the Happy Mood Score metrics. So far we had great responses from coworkers about the Happy Mood Score integration and is a great addition to our application. What do you think about digital nomads and remote work? Do you have any in your company? Would you consider hiring remote workers? We only work with remote designers for development and some tools for both web as marketing. We are currently not looking for remote workers. Thank you very much to Barry and all the people at Zeo for being so nice and answering our questions. If you want to do like them and improve your employee's engagement create a free account and try Happy Mood Score.